Thermal imaging, also called thermography. Everything gives off some amount of thermal radiation and thermal imaging is used for observing the heat that is emitted from these objects. The amount of radiation emitted by an object increases with temperature; therefore, thermal imaging allows humans to see variations in temperature. 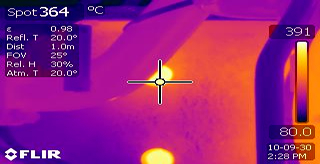 When observed through a thermal imaging camera, hotter objects stand out well against cooler surroundings. 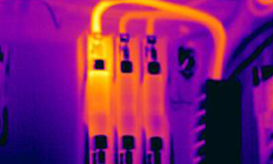 Thermal imaging is used widely in many industries in a predictive and proactive way to ensure electrical safety is met, so that mechanical or electrical failure is prevented. Thermal imaging is also used in security, the military, marine, navigation, surveillance, firefighting, medicine, and science. All Points Safety Thermal Imaging's focus is thermal imaging of electrical switchgear, but we routinely scan bearings, gearboxes, transformers, motors, plant and production equipment. Our client base include hospitals, RSL clubs, hotels, large and small corporations, factories, properly managing agents, shopping centres, government builds and other infrastructure. We have the facility to test and tag. Our policy dictates that we use state of the art thermal imaging devices. Contact us now for a free quote on how we can help you. An Article extract from SPE(Society of Petroleum Engineers) News October 2011 about the Company.